Escupemetralla are the result of a series of retro-transmissions to be carried out in the mid-twentyfirst century at the "Thorne's Cone Light Reversion Laboratory for Children", Los Alamos, Texas (Federal States of Mexico and Puerto Rico). In a certain way, Escupemetralla are just virtual entities that will actually exist in several years' time. Escupemetralla means "Spitshrapnel" in Spanish. 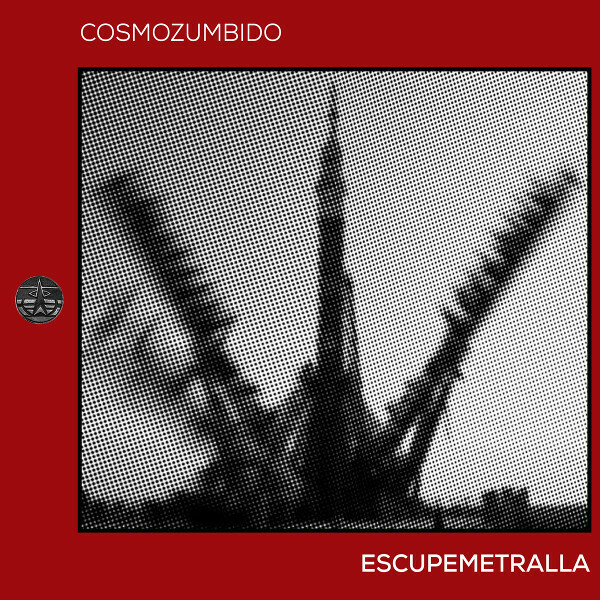 What I have been able to determine from listening to Cosmozumbido, Spanish for Cosmodrone, is that Escupemetralla is an experimental industrial band. This little release contains two sonic collages: “L.A.I.K.A.” and “Gas de Nasqueron.” For those of you who don’t know or are too young to have experienced the space race, the Soviets led the race by launching animals on rockets before attempting manned space flight. Laika was a canine Soviet space explorer, the first dog in space. “L.A.I.K.A.” is a six-minute sound collage of barking dogs, computer generated voices, satellite beeping (think Sputnik), throbbing electronics, and Vladimir Komarov’s voice just before he crashed and burned in his Soyuz space capsule on April 24, 1967. Pretty grim stuff! “Gas de Nasqueron” is a reference to sci-fi author Iain M. Banks’ novel The Algebraist. Nasqueron is a gas giant planet orbiting the star Ulubis and belongs to the Mercatoria Feudal Hierarchy. Over the course of its nine minutes, “Gas de Nasqueron” mixes multi-layered Morse code electronic signals, metallic clanging, heavily processed and unidentifiable sound sources, and rhythmic avant-garde experimentation, very similar to Asmus Tietchens and his suspected involvement on Werkbund’s Skagerrak. I have not heard anything like this in a while, so I found it refreshing.